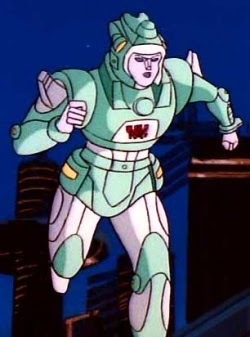 She's Fantastic: Transformers - MOONRACER! Nostalgia is a strange and wonderful thing. Why should a random episode of a cartoon that I watched after school one fateful day in 2nd grade still resonate so strongly with me as an adult? I honestly wasn't even that into Transformers, but I grew up with three TV channels so my options were limited. 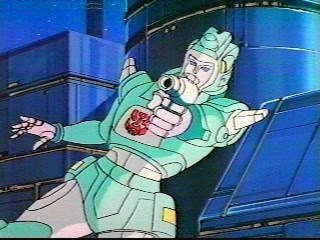 When The Search for Alpha Trion episode premiered, I was completely transfixed. In a male-dominated robotic universe, we suddenly met six glorious fembots that are still burned into my psyche today. When I started seriously collecting toys in my mid twenties, it was extremely nostalgia-based, and it wasn't long before I was Googling away to find if these pastel Cybertronian ladies had ever had toys made. Of course they hadn't, but within a few years those Botcon Energon repaints were released. But I was never super thrilled about them (or their prices). So I waited. And I always included them whenever there was a forum "wishlist" thread. And eventually, a mere 33 years layer, we get perfection. I think an interesting quick custom someone could attempt would be to paint the white part of her "backpack" a slightly darker color like gray or purple to make her waist stand out. It's a great sculpt and has a great silhouette, but if you squint your eyes her abdomen looks like a solid white block. Moonracer comes with a blaster and a piece of Prime Armor. The piece is essentially a chunky piece of kibble. It's intended to mount on the front of her torso and totally obscure her sculpt. But the true purpose is to form either a right or left hand for her arm combiner mode. Her vehicle mode is pretty cool. All the female autobots back in 1985 transformed into these sleek weird alien cars. Her Prime Armor mounts on the back of the car. It's an eyesore. I can't get over how impressed I am with this sculpt. The face and body proportions are perfect. 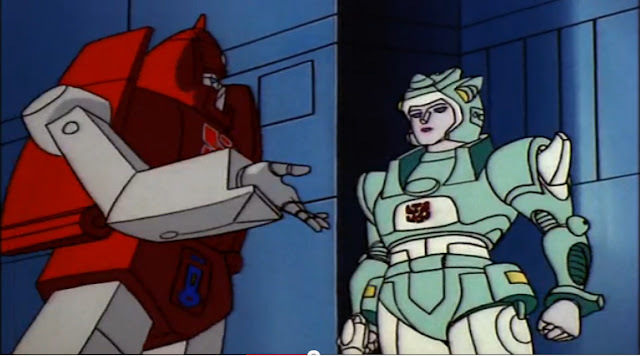 Here are the three Search for Alpha Trion ladies so far: Moonracer, Elita One, and Chromia. Novastar (Firestar) should be out in the Fall to complete the main group. And of course I'm wishing for Greenlight and Lancer. The Power of the Primes line is unique because it has had females in three different scales so far: Legends Slash, Deluxe Moonracer, and Voyager Elita One. Adding Arcee and Nautica just for color. It's interesting to see how varied the current female bucks are: Arcee, Moonracer, and Chromia.